I turned on the television this afternoon while mopping a room at work. I immediately went to ESPN to see who was currently playing in the Wimbledon Tournament. One of the top players in the world, Rafael Nadal, was losing to Lukas Rosol, an uncommon name to be heard in the tennis world. Rosol is ranked 100, while the multi-champion Nadal is ranked number 2 in the world. I found it hard to believe that Nadal was losing in the 2nd round of this tournament. It was one of the most entertaining yet nerve-wracking matches to watch. Rafael won the first set by a tie-breaker. That was probably an indication that this match was not going to be an ordinary one. Usually, professionals can determine the other players’ weaknesses after the first or second set and use that knowledge to defeat them. Rosol won the next two sets making the set score 2-1 in favor of Rosol heading to the fourth set. 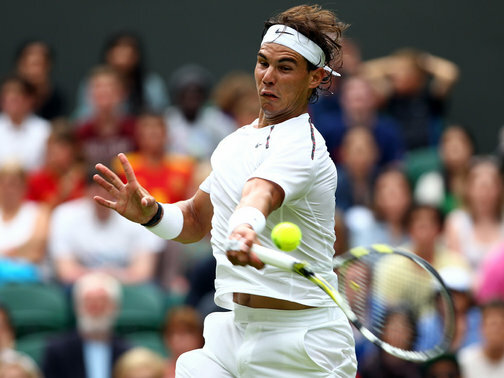 Nadal put up a fight against his opponent who seemingly had much more adrenaline. Rafael got his game together and finished out the fourth set strong. London was getting darker, so the players had a decent break in the locker rooms while the roof was being closed over the court just before resuming play in the final set. Rosol came out fired up and won the first game of the set, breaking Nadal’s service game. After that it seemed all downhill for Nadal. He tried to rally back and fight, but could not break a service game of Rosol’s. In the end, Nadal got the boot in the tournament. He hasn’t left the tournament this early since 2005, when he was just a young player. It saddens me a bit to see a big player go down in flames, but I’m also happy that someone new may take the spotlight in coming years. This loss leaves an opportunity for my favorite tennis player, Andy Murray, to move up in the tournament. Nadal was on Murray’s side of the bracket. Now that Murray does not have to worry about Nadal, he may make a run for the final game, who knows? He might have to go through this Lukas Rosol guy to get there. This tournament has just begun and is already really exciting!